Introducing our new Aura Collection. This Bar Tools Set is perfect for your home bar or at parties. Designed with durability and elegance in mind, this set is constructed of heavy-gauge stainless steel with a Copper finish. 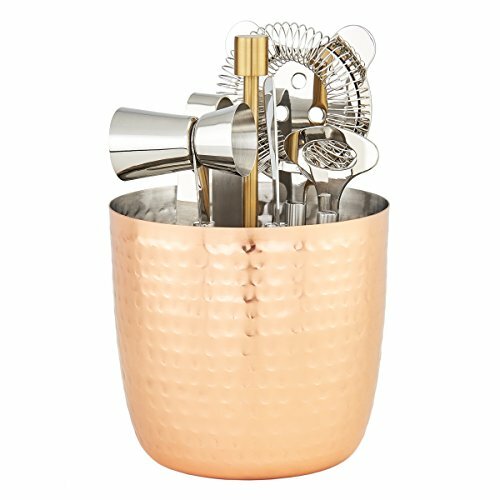 Each set includes an ice bucket with stand and tongs, 1 bottle opener, 1 cocktail strainer, 1 Jigger and 1 bar knife. The Aura Bar Tools Set will be a staple of your bar for years to come. Pair this beautiful Bar Tools Set with other items in the “Aura” line for a coordinated barware set. Leaks It leaks. Looks beautiful so I’ll use it to store bar tools but it’s not functional as a shaker. Great bar bling Really beautiful. Looks quite classy on our bar – and works well too! Nice bartool set Well-made and solid set. I do wish the tools were cooper to match the holder.